Posted on November 13, 2012 by Julie / This entry was posted in Quilting. Bookmark the permalink. 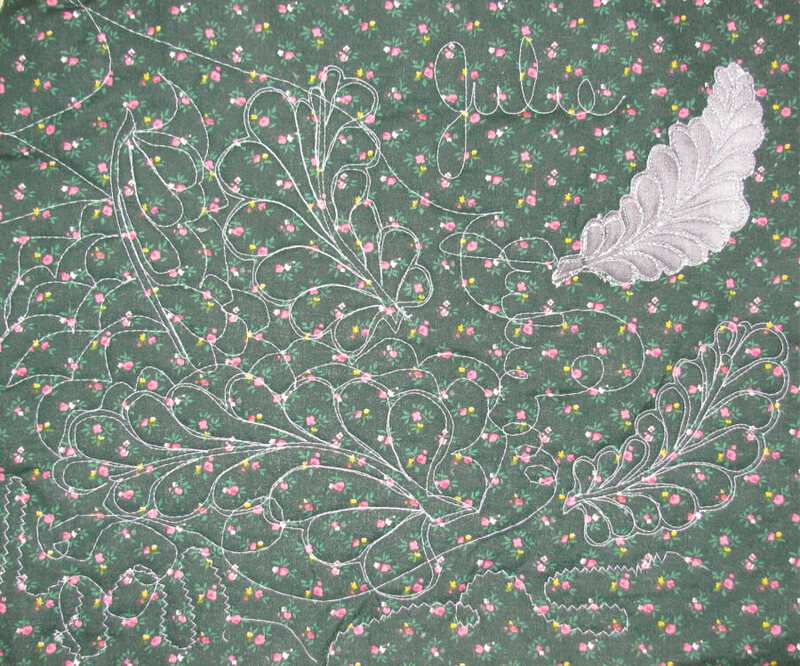 Free motion quilting is a type of quilting where you stitch curvy and/or complicated designs with a sewing machine without the feed dogs feeding the fabric. The operator controls the feed and direction of the fabric, moving it 360 degrees to create designs other than straight stitching. The second obstacle is your ability to move the fabric evenly and consistently “in tune” with your machine to create even stitches and smooth patterns. This falls under operator skill. Let’s talk about each of these things one at a time to learn how each affects free motion quilting. 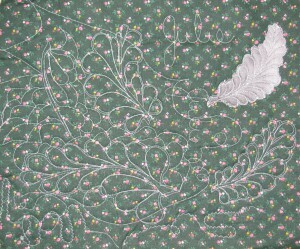 The thread you choose to use while quilting in the free motion manner should be very smooth and fine. It should feed easily off the spool and not “catch” as it feeds. A higher quality thread like Gutermann Sew-all thread or Isacord 40 wt. thread is recommended. Cheaper threads and all cotton threads tend to have little burs and snags that may be imperceptible to the naked eye, but will catch as you stitch and cause broken or frayed thread. If your thread does not come off the spool smoothly and evenly, the little interruptions in feed can cause the thread to rub against the needle and fray or break. The needle you use should be recommended for your machine, new and sharp, not a ball point, and sized appropriately for the material. If you are stitching through cotton fabrics and cotton batting, a size 14 is recommended. If you are using lighter weight fabric, you may be able to go down a size. If you are using heavier weight fabric, you may need to go up a size. The most important thing is to use a new, sharp needle. If your thread is breaking frequently, it is either due to a dull, barred, or crooked needle, or poor quality or unevenly-fed thread. In order to free motion quilt, you must have a darning foot or free motion foot for your machine. This type of presser foot does not put a lot of pressure on your fabric and they allow you to see clearly all around your stitch area. Some darning and free motion feet have larger viewing areas than others. You want to be able to see clearly where you are going and where you have been. If your machine doesn’t have a free motion foot, you can buy a universal foot and use that. It is necessary to have a presser foot on your machine. I have tried to free motion quilt without one and my machine constantly broke thread. In order to be able to free motion quilt, you must be able to move the fabric freely and easily under the presser foot, as you are no longer stitching in a straight line. Having feed dogs that you can lower may be helpful. If your feed dogs do not lower, than you can always cover them with a piece of cardboard or thin plastic. Some models of sewing machines have a special needle plate to use which covers the feed dogs. However, I have found that it isn’t necessary to lower your feed dogs in order to free motion quilt, as you can still move the fabric layers without lowering them. It is helpful if you adjust the pressure of your foot to allow greater freedom of movement. If you have to force your fabric to move than you may cause jerkiness in your stitch pattern and/or the layers to shift and create bunching. Practicing free motion quilting – actually “traced” a paper feather (silver area), wrote my name, and generally just fooled around with it. The settings on your machine can affect your stitch quality as you free motion quilt. The only way to know what settings you need is to experiment. The tension dial most likely will need a higher setting. You may need to adjust your stitch length to zero. Your presser foot tension may need to be set at is lowest setting. As mentioned before, you might want to lower or cover your feed dogs. This is purely on trial and error, as each machine and each operator is different. I suggest you start out with your tension dial at its normal setting, your stitch length at zero if you lower or cover your feed dogs, and your presser foot tension at its lowest setting. Make adjustments on each setting one at a time so you know which adjustment is affecting your stitch quality. I have noted that different fabrics can affect, not only the quality of the stitches, but the frequency of the thread fraying or breaking. Polyesters and polyester blends cause more problems than cotton materials. If you have mixed fabric types in your quilt, you may find that you have to make adjustments according to the fabric type through which you are stitching. If you just starting out with free motion quilting, start with cotton fabrics and cotton batting and concentrate on getting the settings and tools right for your machine. Once you have a good quality stitch with little trouble, than try other fabric types to see how your machine handles them. Then you can make adjustments specific to the fabric type. The first time you free motion quilt, you most likely will notice that your stitches are not locking on the back side. If they are not locking at all, then your machine settings are not correct. Start with the tension dial and move it slowly one way or the other and quilt. Check the stitch quality as you make changes to determine whether the stitching is better or worse. When you think you have improved it, try changing your stitch length to zero and see what happens. If you notice that the stitch is correct sometimes, but in certain places, it isn’t locking, than you have your machine settings correct. What is needed now is more skill from the operator. Pay attention to where the stitches go wrong – when you’re stitching backwards or sideways or on upward curves or downward curves – and try adjusting the speed of your machine to more evenly match the speed of your movements. It is likely that you are moving the fabric too quickly and “pulling” the needle thread rather than letting it feed naturally. If your stitches are very tiny and close together, you are moving the fabric too slowly and the machine is making too many stitches for the distance covered. Either slow your machine speed or move your fabric more quickly. You are aiming for properly locked and evenly spaced stitches. It is very difficult to remain consistent 100% of the time, but the more you practice, the better you get. A pair of quilting gloves or good-fitting exam gloves can make a big difference in your ability to move the fabric easily. It takes a lot of practice to get good at free motion quilting. The first “good” is even stitch length and correctly formed stitches. The second “good” is creating the patterns or designs that you desire. Practice, practice, practice. Take frequent breaks, relax while you work, and practice. 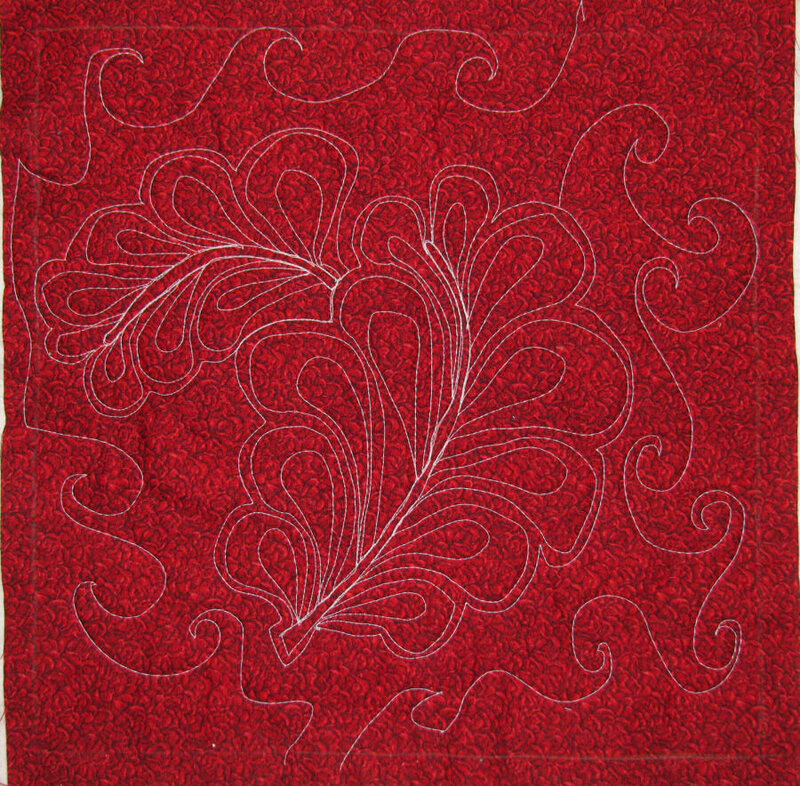 Free motion quilting is both a skill and an art form. It is not for the faint of heart. It takes time and practice to be good at it, but once you have mastered it, you are free to quilt your quilts with beautiful, intricate designs. Check out the video on You Tube of me quilting a twin size quilt on my home sewing machine using free motion quilting. I apologize for the graininess, but it is clear enough to see how I do it. The video makes free motion quilting look easier than it is. It looks like everything moves along so smoothly, but when you are the operator, it doesn’t feel that way at all. My sewing machine is a Janoome 3160QDC.